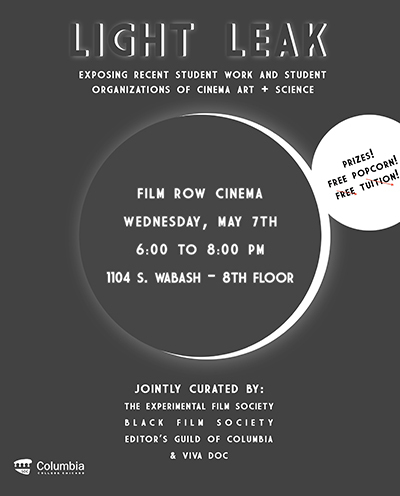 Ted Hardin, Columbia College faculty teaching Image, Time, and Motion in the InterArts department this semester, invites all to see recent student work and student organizations of Cinema Art + Science at Columbia College Chicago at the Light Leak Screening. Wednesday, May 7th 6:00 – 8:00 pm, in the Film Row Cinema, 1104 S. Wabash – 8th Floor. Four CA+S student organizations have teamed up to present and celebrate our hard work! Join us on May 7th in the Film Row Cinema for a student curated show of short films made by students from 2013-14. Light Leak is the latest event in an effort to combine the forces of The Experimental Film Society , the Editors Guild Of Columbia, the BLACK FILM SOCIETY, and Viva Documentary in order to empower students and screen their work, and works to engage students and help create community between the many talented artists in the Cinema Art + Science department and throughout the college.